Turkish Statistics Agency announced 11% rise in the revenues generated from tourism-related activities. 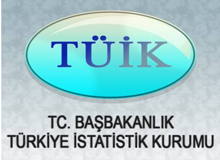 Turkish Statistical Institute (TUIK) has revealed 2014 tourism data for the period of June-September. The TUIK figures showed that yield from the tourism-related activities in the third quarter has reached 12 billion 854 million 373 thousand US dollars, achieving an 11 percent rise when compared with the same period of the last year. The number of visitors travelling from Turkey to other countries has jumped to 17 million 84 thousand 13, showing a 6.4 percent increase for the same quarter of 2013.